PushCrew is a web push notifications platform designed to help users reach their customers even when they aren't on the website. "É bem útil! Simples e fácil de usar. Além de ser grátis!" É simples de usar e bem interativo, não tem como não entender. E tem ótimas ferramentas para atingir os meus clientes. É compatível com praticamente todos os melhores navegadores em uso atualmente. O site permanece rápido mesmo após instalar. E, mesmo eu sendo Brasileiro, eu consegui realizar todas as configurações sem nenhuma dificuldade. Recomendo a todas as pessoas! Acredito que não encontrei nada que eu não goste até o momento. O volume de 2000 inscritos é excelente para quem está começando. No entanto o valor do plano anual/mensal é um pouco caro! Se pensar que eu estou fazendo uma assinatura de algo em dólar e minha moeda é o real, esse valor é absurdamente caro. Não compensa adquirir a opção paga pois irei gastar muito mais com assinatura do que produzindo conteúdo para os meus clientes. Se houver uma opção de valor local, ou pagamento de outra forma, que não seja tão absurdo quanto a conversão de moeda. Sim, eu pensarei em assinar! Eu gostei! É fácil de usar, tem várias funções e funciona perfeitamente com Wordpress. Se tiver dúvidas, me pergunte! Sinceramente, eu estou conhecendo essa ferramenta agora. Acho que será muito útil para minha empresa. Como eu estou criando um BLOG empresarial, acredito que é essencial atingir os meus clientes onde quer que eles estejam e, no caso da Internet, é ótimo avisá-los diretamente pelo navegador. Acho incrível essa possibilidade de atingir até 2000 visitantes de uma única vez e de forma gratuíta. "Good sharing tool - simple to use"
The platform is easy to use and offers nice features (like pre-scheduled notifications). The notifications themselves can be fairly customized to grab attention and based on platform. The analytics are simple but effective. Customer service is difficult to contact and there is no "self help" portal. There aren't many in-platform options for account management, meaning you need to contact customer support for simple things (like updating billing info). This tool can be fairly robust or fairly simple, depending on your needs and how much time you want to dedicate to managing it. I use PushCrew as an additional way to get company blogs and news in front of interested parties. PushCrew allows for a good amount of customization, including the opt-in messaging, push notifications, timing, etc. The notifications can be segmented and optimized to drive better results. You can also schedule notifications (similar to a social media management platform), which is great for busy marketing teams. There are a good number of features, so it can be as robust or simple tool as you want. The subscriber and notification analytics aren't incredibly robust but get the job done. It's a good way to get in front of interested people and see what resonates as well as drive some additional web traffic. Business plans are reasonably priced and allow for a good number of subscribers. The customer support and account management is all down via email though, so it's not easy to address issues or cancel your plan. 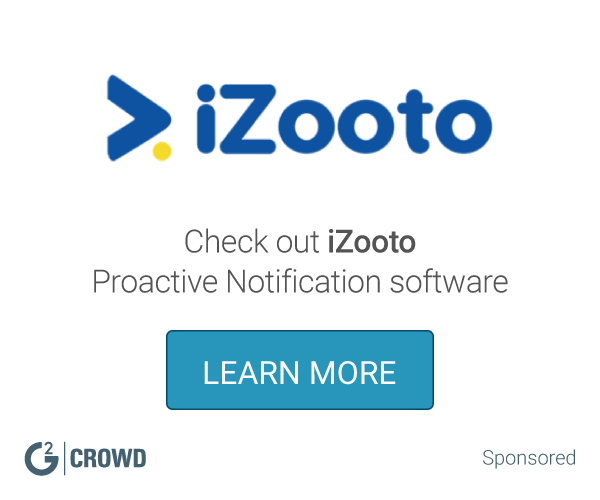 What Proactive Notification solution do you use? "Amazing support and ease of use!" We were looking for a new high-converting channel to engage our audience and increase the quality of our traffic. Based on our analytics, referrals from Pushcrew had the highest retention and engagement. Furthermore, the segmentation features allow us to personalize our push notifications to ensure our audience is receiving tailored content. This has ultimately allowed us to reengage our audience in a new format resulting in click through rates that are much higher than the traditional email channel. "Simple Web Push Notification Service"
PushCrew is one of the popular Web Push Notification service providers that comes with a free plan allows 2000 subscribers for absolutely free. PushCrew brings web push notifications for almost all modern browsers like Chrome, Firefox, Opera, all the same browsers for Android. The PushCrew competitor PushEngage offers 2500 subscribers for absolutely free. I don't know this is a disadvantage, but most newbie bloggers will move to PushEngage. Also, data and reporting are not up to mark. If you are looking for an all in one powerful web Push Notification services, PushCrew is the best choice for you. Big Image support helps our Push Notifications more visually communicative and it increases our CTR around 25%. I love the simplicity of use and the excellent customer service! I recently changed the name of my website and couldn't figure out how to integrate; the staff was so friendly and helpful! NOTHING! There are no complaints against this company or its product! I am working around Facebook not putting my posts in NewsFeeds! Pushcrew lets us talk instantly to our customers without needing to pay facebook or worry about email filters. Nothing, it works great and the customer service is very responsive. If you want to talk directly to your fans it's great. "Great Tool with many features"
Pushcrew offers a really easy-to-use dashboard to our content creators who can easily send, schedule, and report notifications. The API helps our tech team to implement Pushcrew functionality very flexibly. The Support team and our customer success manager take care of our questions, issues, and requests immediately. We experienced some minor bugs. And furthermore, the insight section could be improved. No option to apply time filters, insights on subscribers only 14 days back. Pushcrew helps us get targeted traffic to our websites and thus supports the growth of our audience. "Very easy to start & use on daily basis"
Pushcrew is one of the best tools to send push notification to your website visitors. We use it on a dozen of websites and it's very easy to start with it. It has great features and keeps getting better every 2-3 months. A lot of features and very easy to install on your website. You can now segment your visitors (countries, operating system...). Use pics & buttons. Just sign-up and start using pushcrew, the entreprise plan has a lot of features to target your visitors. Pushcrew helps us to reach our customers and convert them in returning visitors. "Great tool to distribute your content"
Automatic blog push & welcome series. It was easy to set-up. Benefits is really a content amplifier for the site. I had a challenge and emailed support. They replied me to quickly and we went back and forth a couple of times to find a solution. There really isn’t much that you have to deal with so there isn’t anything I can think of. Getting the word out about my posts. More repeat readers. Fast engagement tool. Very easy to use!! "Great stuff to reach more people"
"Great service; own your push subscribers!" Great dashboard and live subscriber counts. Not really live reports, which can slow down your decision making process. News portal breaking news publishing. Unfortunately the inadequacy of reports is a huge problem. The reports that can be exported from the interface can be developed. With the support of Pushcrew most of our flash campaigns became more visible and more efficient. How easy it is to setup. It also looks clean and crisp in the front end. It feels a tad clunky on the back end. It could be simpler. Really high click-through percentage compared to email. "Great Web APP to increase return visitors"
* We monitor all PushCrew reviews to prevent fraudulent reviews and keep review quality high. We do not post reviews by company employees or direct competitors. Validated reviews require the user to submit a screenshot of the product containing their user ID, in order to verify a user is an actual user of the product. Hi there! Are you looking to implement a solution like PushCrew?